Jason Neely founded Stratos in 2014, when he and a small group of people left the pharmaceutical industry in search of a new endeavor in the cannabis marketplace. The concept was straightforward: Apply pharmaceutical methodologyof production to cannabis products. Back then, Stratos offered a range of THC-infused tablets in the Colorado market. 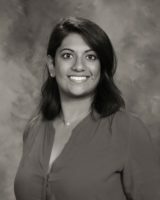 Brenda Verghese, vice president of research & development, was one of five people on staff when Stratos launched. Now they have about 30 team members. Consumers were looking for a cannabis product that would be consistent and reliable every time, taking the guesswork out of infused products dosage. That’s where Brenda Verghese found her skillset useful. 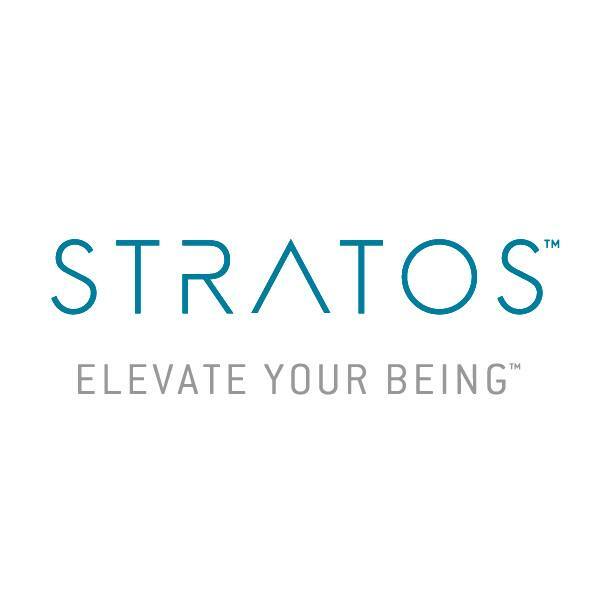 Soon after the success of their THC products became apparent, Stratos launched a CBD line, quickly growing their portfolio to include things like tinctures and topicals as well. 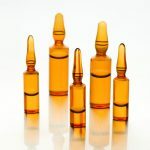 According to Verghese, they are hoping that what’s been established on the THC side of their business as far as reproducibility and consistency is something that consumers will also experience on the CBD side. “Quality and consistency have definitely driven our growth,” says Verghese. “That is what consumers appreciate most- the fact that every tablet, tincture or swipe of a topical product is going to be consistent and the same dose every time.” This is what speaks to their background in the pharmaceutical sciences, FDA regulation has taught the Stratos team to create really robust and consistent formulations. Verghese says maintaining that attention to detail as their company grows is crucial. They implement robust SOPs and in-process quality checks in addition to process testing. They test their products 5-6 times within one production batch. Much of that is thanks to Amy Davison, director of operations and compliance, and her 15 years of experience in quality and regulatory compliance in the pharmaceutical industry. Product testing alone cannot assess quality for an entire lot or batch of product; therefore, each step of the manufacturing process must be controlled through Good Manufacturing Practices (GMP). 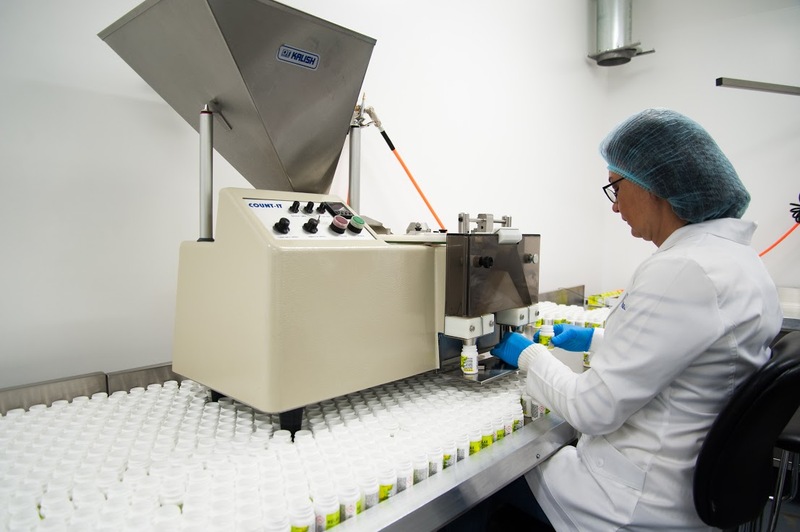 Process validation is an aspect of GMPs used by the pharmaceutical industry to create consistency in a product’s quality, safety and efficacy. There are three main stages to process validation: process design, process qualification and continued process verification. Implementing these stages ensures that quality, including dosing accuracy, is maintained for each manufactured batch of product. 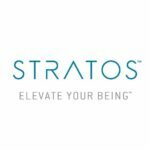 Fast forward to today and Stratos is looking at expanding their CBD products line significantly. While their THC-infused products might have a stronger brand presence in Colorado, the CBD line offers substantial growth potential, given their ability to ship nationwide as well as online ordering. “We are always evaluating different markets and looking for what suits Stratos and our consumer base,”says Verghese. 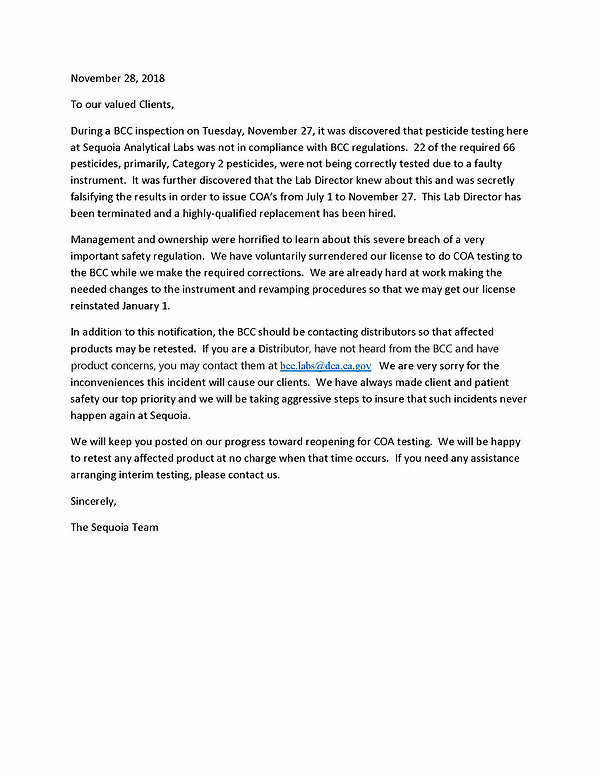 Last month, Sequoia Analytical Labs admitted that they falsified hundreds of pesticide tests for batches of cannabis products. The Sacramento-based laboratory faked data on 22 different pesticide tests for more than 700 batches over a period of four months. 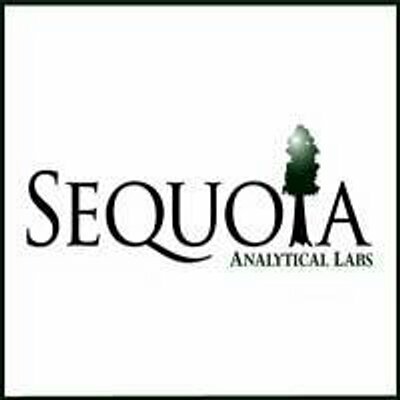 According to a notice posted on Sequoia’s website, the skewed results were originally found due to a “faulty instrument” but “it was further discovered” that the lab director knew about it and was fraudulently posting the results in order to hand out certificates of analysis. 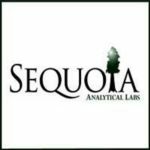 The lab director in question has since been fired and Sequoia voluntarily relinquished their state license. Joe Devlin, Sacramento’s chief of cannabis enforcement, told KCRA3 News “We’re going to be taking a look at suspending or possibly revoking their permit.” He followed that up with saying that California needs more testing labs. “The shortage of labs has really created a bottleneck in the supply chain across the state,” says Devlin. There are only 43 licensed laboratories in the state of California as of this time, and just three of those are in Sacramento. 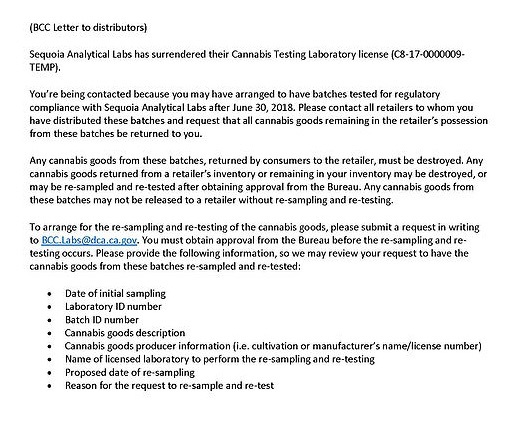 As of today, the lab’s license has not been reinstated. Documents play a key role in the world of regulations and global standards. Documents tell a story on programs development, implementation and verification during an inspection or audit. Documents are used as evidence to determine conformance to the law or standard. However, do you know what kind of documents may be reviewed during a regulatory inspection or a food safety audit? Are you prepared to show that the implementation of regulatory requirements or a standard is done efficiently at your facility? A well-developed and implemented DMP provides control over documents by providing a number sequence and revision status to the document. In addition, ownership for development, review and distribution of the documents are assigned to specific individuals within the company to ensure that there are no inconsistencies in the program. Documents must also have the name of the company in addition to a space to write the date when the record is generated. It is recommended to include the address if there are multiple operational sites within the same company. Program: A written document indicating how a business will execute its activities. When it comes to the food industry, this is a written document that indicates how quality, food safety and business activities are controlled. Procedures: General actions conducted in a certain order. Standard Operational Procedures (SOPs) allow the employee to know what to do in general. For example, a truck receiving procedure only tells the employee what the expected conditions are when receiving a truck (cleanliness, temperature, etc.) However, it doesn’t tell the employee how to look for the expected conditions at the time of the truck arrival. Work Instructions: Detailed actions conducted in a certain order. For example, truck inspection work instruction tells the employee what steps are to be followed to perform the inspection. Forms: Documents used to record activities being performed. Work Aids: are documents that provide additional information that is important to perform the job and can be used as a quick reference when performing the required activities within the job. Are you prepared to face document requirements now and in the future? The inspectors and auditors base their role on the following saying: “Say what you do. Do what you say. Prove it!” The programs say what the company do. The procedures, work instructions and work aids provide information on implementation (Do what you say) and the forms become records that are evidence (prove) that the company is following their own written processes. In the always evolving cannabis industry, are you prepared to face document requirements now and in the future? In the last article I referred to the analogy of the analytical reference material being a keystone of the laboratory foundation, the stone upon which all data relies. I then described the types of reference materials and their use in analytical testing in general terms. 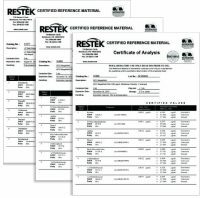 This article will describe the steps required to properly manufacture and deliver a certified reference material (CRM) along with the necessary documentation. A CRM is an exclusive reference material that meets strict criteria defined by ISO Guide 34 and ISO/IEC 17025. ISO is the International Organization for Standardization and IEC is the International Electrotechnical Commission. These organizations work together to set globally recognized standards. 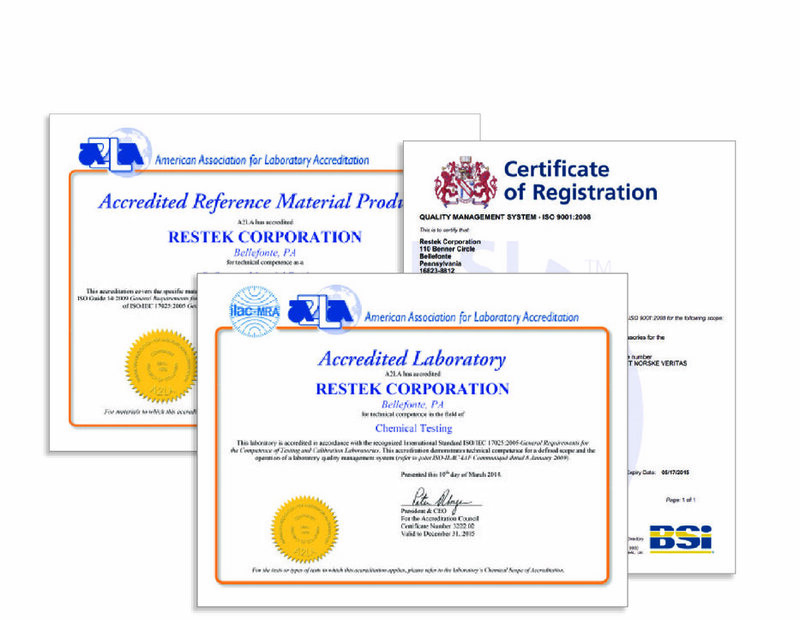 In order for a reference material to be labeled as a CRM it must 1) be made with raw or starting materials which are characterized using qualified methods and instruments, 2) be produced in an ISO-accredited lab under documented procedures, and 3) fall under the manufacturer’s scopes of accreditation. Verifying a CRM supplier has these credentials is easily done by viewing their certificates which should include their scopes of accreditation. There are many steps required to produce a CRM that meets the above three criteria. The first step requires a review of the customer’s, or end-user’s requirements to carefully define what is to be tested, at what levels and which analytical workflow will be used. Such information enables the producer to identify the proper compounds and solvents required to properly formulate the requested CRM. The next step requires sourcing and acquiring the raw, or starting materials, then verifying their compatibility and stability using stability and shipping studies in accordance with ISO requirements. Next the chemical identify and purity of the raw materials must be characterized using one or more analytical techniques such as: GC-FID, HPLC, GC-ECD, GC-MS, LC-MS, refractive index and melting point. In some cases, the percent purity is changed by the producer when their testing verifies it’s different from the supplier label. All steps are of course documented. The producer’s analytical balances must be verified using NIST traceable weights and calibrated annually by an accredited third party provider to guarantee accurate measurement. 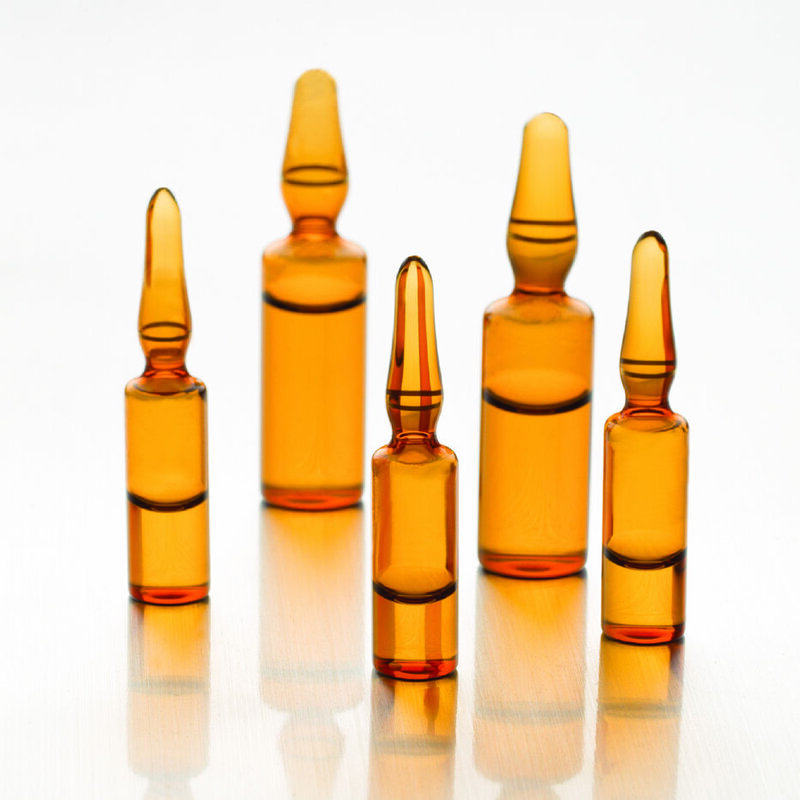 CRMs must be prepared using Class A volumetric glassware, and all ampules and vials used in preparation and final packaging must be chemically treated to prevent compound degradation during storage. Next, CRMs are packaged in an appropriate container, labeled then properly stored to maintain the quality and stability until it’s ready to be shipped. 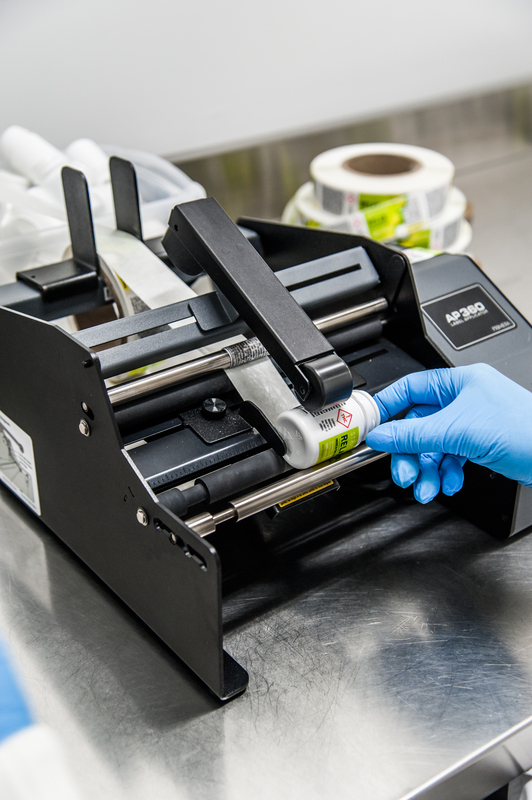 All labels must include critical storage, safety and shelf life information to meet federal requirements. The label information must be properly linked to documentation commonly referred to as a certificate of analysis (COA) which describes all of the above steps and verifies the traceability and uncertainty of all measurements for each compound contained in the CRM. 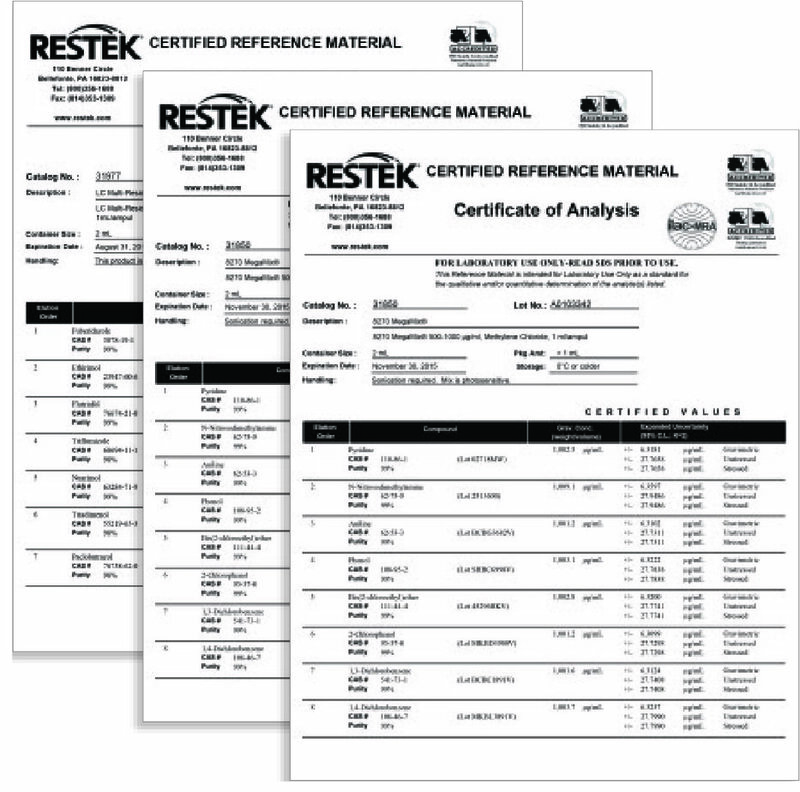 My company, RESTEK, offers a variety of documentation choices to accompany each CRM. 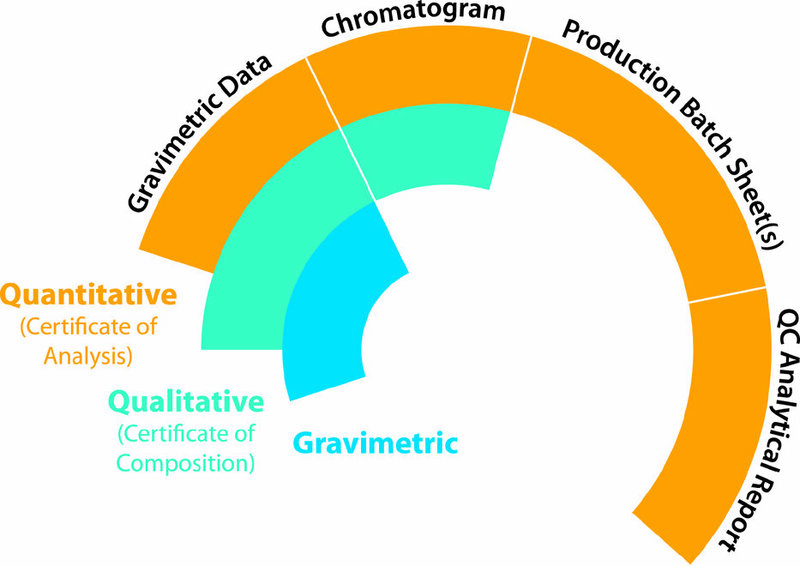 Depending on the intended use and data quality objectives specified by the end-user, which were defined way back at the first step, three options are typically offered: They include gravimetric only, qualitative which includes gravimetric, and fully quantitative which includes all three levels of documentation. The graphic to the right summarizes the three options and what they include. It’s important to understand which level you’re purchasing especially when ordering a custom CRM from a supplier. 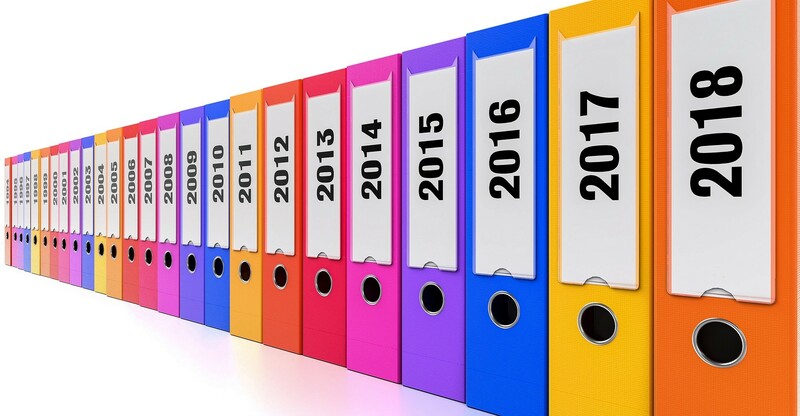 Most stock CRMs include all three levels of documentation, but it’s important to be sure. Understanding what must be done to produce and deliver a CRM sets it apart from other reference material types, however it’s important to understand there are some instances where CRMs are either not available, nor required and in those situations other types of reference materials are perfectly acceptable. If you have any questions or would like more details about reference materials please contact me, Joe Konschnik at (800) 356-1688 ext. 2002 by phone, or email me at joe.konschnik@restek.com. Based in Santa Monica, California, Sagely Naturals was founded in the summer of 2015, with the goal to produce a sustainably sourced, topical CBD cream with no psychoactive effects to treat daily aches and pains. The co-founders, Kerrigan Hanna and Kaley Nichol, have extensive backgrounds in the food service industry, and as a result they pride themselves in quality controls and proper safety procedures. 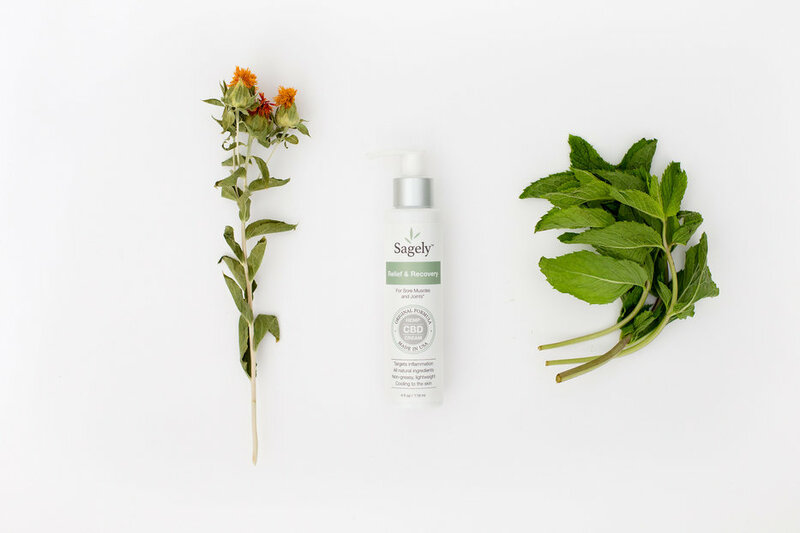 Since the launch of Sagely Naturals, they have been selling their Relief & Recovery Cream online and in a wide variety of retail outlets beyond just cannabis dispensaries. Their ability to distribute outside of dispensaries is due to the fact that the product’s active ingredient, Cannabidiol (CBD), is derived from hemp, instead of cannabis with higher levels of Tetrahydrocannabinol (THC). Their attention to detail in consistency and quality makes them stand out as cannabis processors, using a contract manufacturer with good manufacturing practices (GMPs) along with the proper standard operating procedures (SOPs) in place. “All of our contract manufacturer’s corrective and preventative actions (CAPAs) are outlined in the company’s SOPs, which are in place for everything including specific manufacturing processes, receiving and shipping materials and testing batches,” says Hanna. 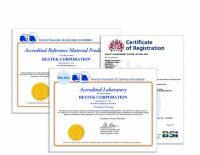 “The contract manufacturer also provides certificates of analysis (COAs) for every product they make.” According to Hanna, they exclusively use current GMP-certified facilities. One such SOP lays out the responsibilities for the quality control department in order to release and approve ingredients of their products. There are some SOPs that could pertain specifically to the processing of hemp or cannabis products, according to Hanna. “Receiving and handling raw materials like hemp, batch coding, the actual formulation and manufacturing process, quality controls and cleaning and sanitation [could be tailored to pertain to cannabis],” says Hanna. Proper SOPs laid out in the manufacturing process include the cleaning and sanitation of machines, as well as adjusting settings, formula ratios and initialing and dating product labels on every batch, among more specific operating procedures. The cream is made with natural ingredients like safflower seed oil and peppermint. According to the co-founders, they spent a large amount of time vetting their hemp supplier, making sure they are using cutting-edge technology, growing it sustainably, and adhering to strict SOPs. “The team includes a Ph.D. chemist, who also is a founding member of our supplier and extractor,” says Hanna. “We work with CO2 extraction because we wanted the most control over the compounds that end up in our product. We are able to purposefully choose which cannabinoids end up in our product.” Through supercritical carbon dioxide extraction and post-extraction processing, the team is able to eliminate any trace of THC, guaranteeing the consumers will receive no psychoactive effects. 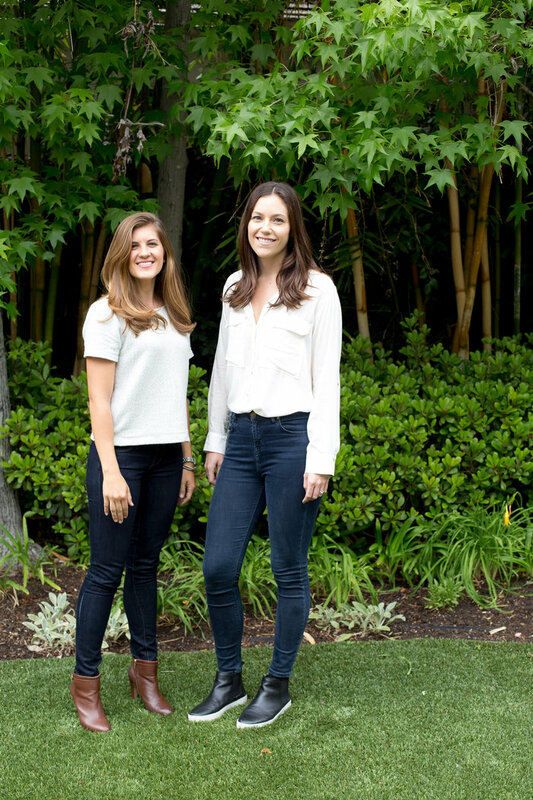 In looking toward long-term growth, the co-founders emphasize the importance of environmental sustainability. “Having honest ingredients is one of our company missions along with having honest practices,” says Hanna. “None of our ingredients are tested on animals so we are an animal cruelty-free organization.” Their hemp is grown using organic and environmentally friendly practices. “We prioritize using plant-based ingredients, so the formulation of our Relief & Recovery Cream relies on using organic and raw materials—such as essential peppermint and safflower oil.” Companies like Sagely Naturals using contract manufacturers to process hemp could represent the future of the cannabis industry. When safety, sustainability and quality issues come into the spotlight more, so will the need for outlined SOPs, proper documentation and extensive lab testing.